The major drivers of stock prices are very likely to worsen over the next 5 years. .Corporate profit margins should be narrower. .Interest could be lower, but only due to extraordinary central banks actions. .Business financial leverage will be in a danger zone if it increases much from today's high levels. .Global GDP growth, a proxy for business sales should continue to trend lower. My article last week, “$2+ Trillion Federal Deficits Are Coming And Will Weigh On Stock Prices, Sell Into Rallies, Like This One”, was kind of depressing. Shockingly, investors shrugged it off; the S&P 500 was up 0.5% for the week. Even after Alan Greenspan agreed with one of my key theses. Faced with that brazen indifference into my insights, I’ll double down. For all I know, the market will be up another 10% this year. But over the next five years? I am steadfastly pessimistic. And if the long-term story isn’t good, the odds are (no guarantee!) that the short-term won’t be either. I have therefore been net/net selling stocks recently, and getting more conservative about the ones that I do own. I suggest that you consider doing the same. Why all the doom and gloom? Because of an algebra formula. You know this formula intuitively. You know that the more current earnings and the more expected earnings growth, the higher the stock price. (Except for Uber of course, for whom math rules developed over thousands of years are suspended). And you know that higher interest rates and more financial risk push stock prices lower. The formula just puts these facts together into a tidy bundle. My doom and gloom is due to the fact that the four variables likely can’t get much better and almost certainly get worse. Recall that market maxim “buy on the rumor, sell on the news”? Well, the good news is pretty much all in, people. Let’s review the variables, shall we? 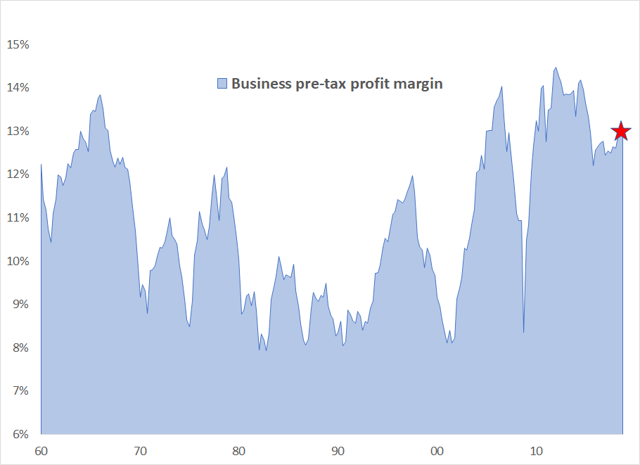 The profit margins of U.S. businesses are sitting near all-time highs. Two primary reasons are (1) increased access to global labor pools, which has given businesses wage bargaining power versus their employees, and (2) the increased concentration of many industries, which has given them pricing power versus their suppliers and customers. For example, the major consolidation of the U.S. airline industry is a key reason why I recommend American Airlines’ stock. Unemployment is currently at a record low. The U.S. labor pool is shrinking because of high Baby Boomer retirements. Tougher immigration policy is further shrinking the pool of illegal and legal available employees. Trade policy is trying to limit imports created by cheap labor. 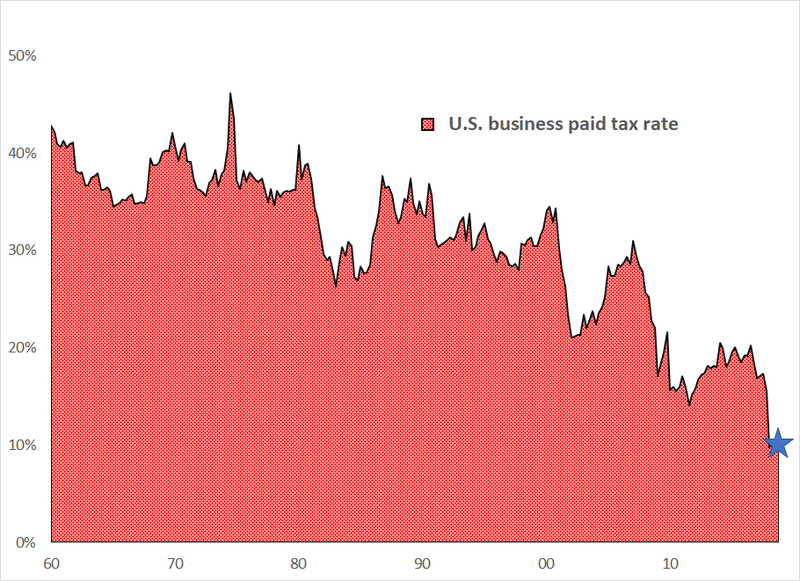 The average U.S. corporate tax rate paid is not near its all-time bottom, it’s at the bottom. Are U.S. business tax rates likely to be higher or lower 5 years from now? This one is easy. Higher. As I said in my last piece, the current nearly $1 trillion federal budget deficit will be closer to $1.5 trillion 5 years from now without any policy changes. And the populace is itching for more spending, from infrastructure to health care to…lots more stuff. Even Republicans will likely be looking for sources of extra tax revenues by then. Business owners – and that includes you, investors – don’t get used to a 21% maximum tax rate. The 10-year Treasury yield is sitting near its all-time low. The bottom-line reason for the low yield is that record U.S. and global debt levels have coerced the Federal Reserve and its fellow major central banks into doing all that they can to keep the cost of that debt manageable, by keeping interest rates as low as possible. Their tools are low fed funds rates and quantitative easing (QE). 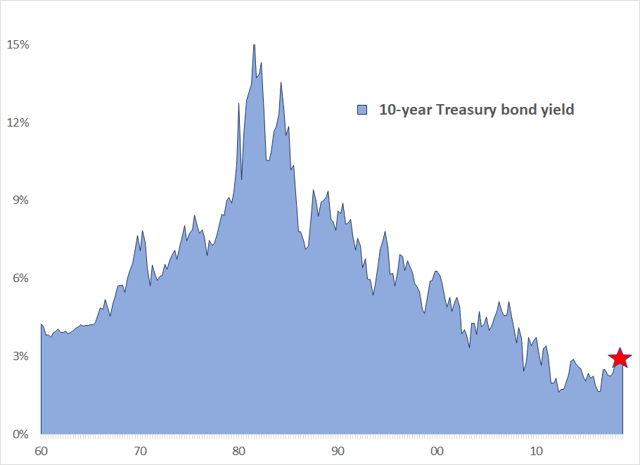 Is the 10-year Treasury bond yield likely to be higher or lower 5 years from now? This actually could be a bright spot for stock valuations. Yes, bond yields could be even lower 5 years from now, because debt levels will of course be even higher, with that much more pressure on central to lower interest rates banks (see POTUS for pressure argument). The interest rate risk is a material pickup in inflation, which is certainly a possibility if wage rates rise and/or if low-cost imports are limited due to new trade agreements. If so, central banks’ hands may be forced into raising interest rates. 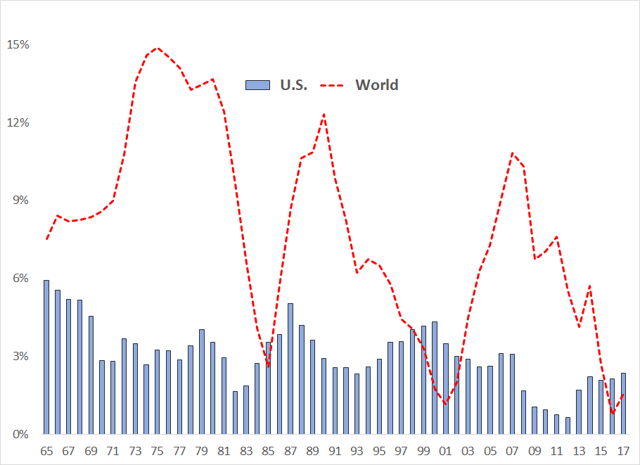 The chart shows that the U.S. corporate debt ratio, while below the global average, sits at a record. 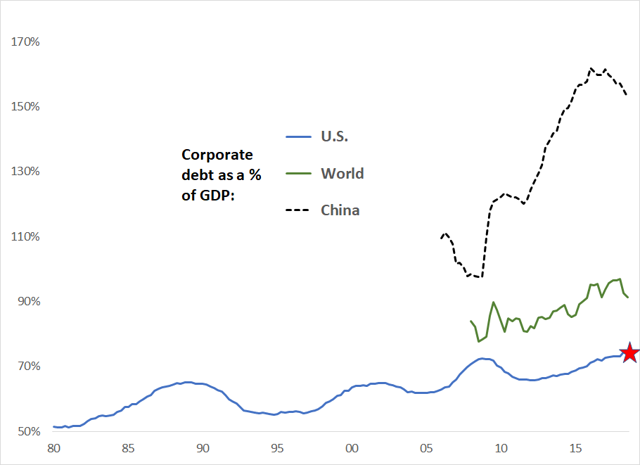 The global corporate debt ratio is near its all-time high. Finally, we have China. Ah, China. A business debt explosion over the past decade. The BIS data tends to be volatile, so I am skeptical that its debt ratio recently declined. 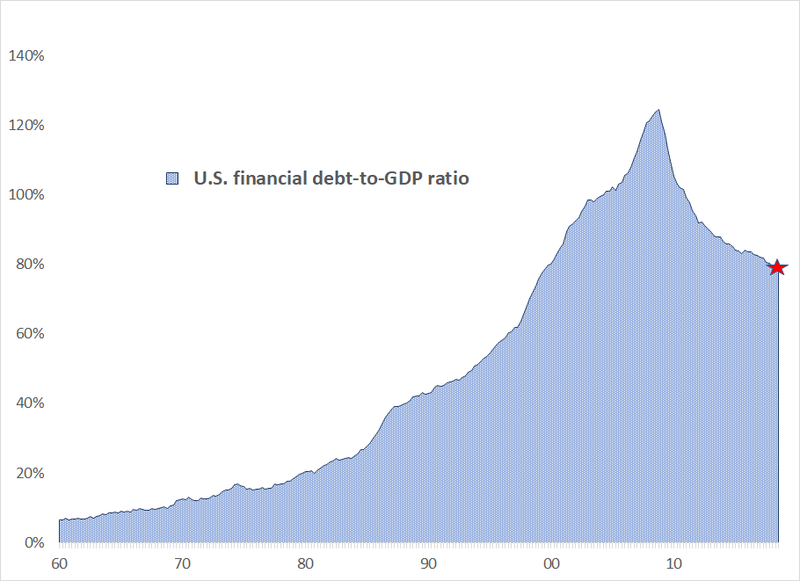 U.S. financial system leverage is certainly far from a record, but remember that the record level helped cause the Great Recession, and forced the TARP bank bailout. So it is not comforting that financial system leverage today exceeds levels prior to 2000. Will corporate and bank leverage likely to be higher or lower 5 years from now? They certainly could be higher. But because corporate debt is already at a record leverage, and bank leverage is high, any further expansion is cause for concern. 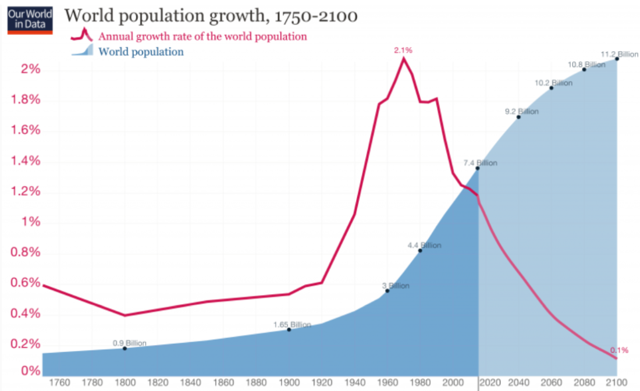 Will U.S. and global likely to be faster or slower 5 years from now? Common sense says slower. Corporate after-tax profit margins will be narrower. Interest rates could be lower, but only because of extraordinary central bank actions. Corporate financial risk is pretty high today, so any further leveraging should be viewed by investors as concerning. Global GDP growth, a proxy for business sales growth, is likely to continue to trend lower. Sell into rallies. Like this one. Disclosure: I am/we are long AAL. I wrote this article myself, and it expresses my own opinions. I am not receiving compensation for it (other than from Seeking Alpha). I have no business relationship with any company whose stock is mentioned in this article.